If you've seen the internet (or Giz) this weekend, you've heard about it: the "real Google phone" that "changes everything." But before we get carried away, a counterpoint: Google isn't magic. And the Nexus One isn't a game-changer. Not yet. It's an HTC Android handset. This means that on a material level, it's barely more of a Google phone than the G1—which Google passively oversaw—or the Motorola Droid—which Google actively helped design. And hey, people remember: Google still isn't a hardware company. Not even close. The hardware isn't revolutionary. It's the third (at least) Snapdragon-powered Android phone we've heard about. It's got a 5-megapixel camera. It's got dual microphones, to help with noise reduction. It's fairly thin. These are nice features for a new phone, but they're more or less exactly what we'd expect HTC to be working on next. It's pretty much running Android 2.0. People are talking a lot about how Google had full control over the Nexus One user experience, and how it's going to be unlike any other Android we've ever seen before. But we've seen other builds of 2.1, albiet covered in the Sense UI, leaked for the HTC Hero (spoiler: not that impressive), and combined with the early glimpses we've caught from spy shots, they give the feeling that 2.1 isn't much of a step up from 2.0, which is what the Droid ships with, which, mind you, Motorola doesn't seem to have touched almost at all. 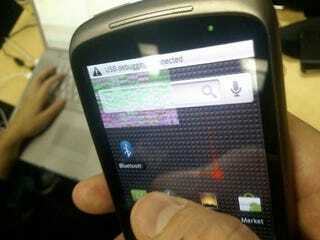 As far as I can tell, the Nexus One will have some pretty new UI flourishes, and maybe a few UX changes. Again: this is typical, paced progress, not a drastic overhaul. The new business model isn't really new. Even the most breathless commentary on the Nexus One admits that what it means is more important than what's on its spec sheet. And yeah, it'll be the first phone marketed as the Google phone, and Google's sales strategy—to offer the device without contract first, and probably unlocked, with a (hardware limited—possibly just to T-Mobile, if you care about 3G) choice of carriers—is foreign to the US market. But it's far from unheard of—you can buy unlocked phones at Best Buy, for God's sake. Oh, and Nokia's been handling their US smartphone releases like this for years. It hasn't gone well. Google doesn't have superpowers. Using their unmatched internet superpowers, Google can do more to convince the general public that an expensive, unsubsidized phone is a good idea than Nokia, whose marketing efforts have been wimpy and ineffective. But they can't do anything crazy, like give this thing away. They can sell it for cheap by relying on their own advertising network—or hell, their homepage—for advertising, as well as the massive press coverage they're already getting, and selling it at little to no profit. To be able to match carriers' prices, though, will be a stretch: A Verizon or a T-Mobile can absorb the cost of a phone in month-to-month fees and overage charges. What does Google have? Theoretical future Adsense revenue? Even if what we see now is exactly what we're going to get, the Nexus One is something worth paying attention to—it will be a way for Google to demonstrate what their vision for Android is without carrier interference. They'll control the software experience on the phone; they'll control how it's updated; they'll control what software is and isn't allowed on it. And they could use it to convey an vision for Google Voice, in which Google supplies your number, your nonstandard calling rates and your texting allowance, while carriers simply supply a neutral, dumb and ultimately out-of-sight cellular connection. But even if that is what they're doing—we don't know!—the Nexus One is a first step. It'll be an early product to guide the progress of an industry, not the product that'll define it. Whenever we talk about Google, we need to factor in a little windage. They're buzzy, they're huge, and they've thrown plenty of other industries curveballs before. This phone sits at the hype nexus (for lack of a better word) of Google Voice, Android, Google's online services and HTC. For now, to say that the Nexus One has somehow changed everything is to buy into these company's hype too earnestly, to ascribe to Google mystical qualities, and to take for granted a series of future actions that Google hasn't even hinted at fulfilling yet. Apple isn't the only company tech watchers recklessly project onto. Or, to compress it to 140 characters or less: "The Google phone matters as much as Google makes it matter." For now, people, calm down.